The annual open house at Lancaster Airport is coming soon. The Cold War Air Museum will be participating with aircraft flying and on display along with the Commemorative Air Force DFW wing. The airport will also be hosting other aircraft and events. On event days a shuttle tram operates between the two museums, the restaurant and the parking areas. 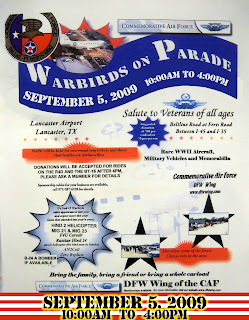 During the Sept. 5th event, there will be additional parking and aircraft displays on the main ramp. Check the museum schedule and location page for an aerial view of the airport and parking areas or click here for an area map. Select "get directions" for driving assistance. Davy Crockett! - King of the wild frontier.